I and II Thessalonians are letters written to the first, and then subsequent, generations of Christian communities in Thessalonica and the wider church. As our earliest Christian document, I Thessalonians is Paul's letter about how the Christian faith was interpreted in a new context twenty years after the beginning of the church. II Thessalonians, written by a teacher in the second generation of the Pauline school tradition, gives insights about how later generations interpreted the Pauline gospel, and is theologically instructive for our own efforts to do the same. 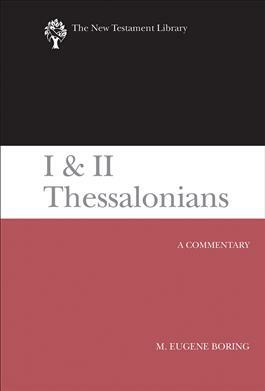 In this new volume in the acclaimed New Testament Library series, M. Eugene Boring offers a scholarly interpretation of I and II Thessalonians while examining their historical context. Boring helps the reader learn to read these letters in context, particularly in relation to Paul's life as well as to the new converts who lived in Thessalonica. He addresses aspects such as structure, tone, style, language, and—for II Thessalonians— questions of authorship, while offering insightful theological perspectives. Boring's critical interpretation is a welcome addition to the New Testament Library and provides a solid resource for both the academy and the church. The New Testament Library offers authoritative commentary on every book and major aspect of the New Testament, providing fresh translations based on the best available ancient manuscripts, critical portrayals of the historical world in which the books were created, careful attention to their literary design, and a theologically perceptive exposition of the biblical text. The editorial board consists of C. Clifton Black, Princeton Theological Seminary; M. Eugene Boring, Brite Divinity School; and John T. Carroll, Union Presbyterian Seminary. "M. Eugene Boring's treatment of 1 and 2 Thessalonians is thoroughly researched, exegetically perceptive, and theologically insightful. Boring helps the contemporary reader listen in on the conversations between Paul and the Thessalonians and between Paul's literary descendent and those same Christians with keen awareness of the political, social, and religious environments in which they lived. This is a master work by a wise and seasoned scholar."